The Laser GRC suite offers world-class software solutions for Internal Audit, Risk Management and Legal Compliance Management. Having a systematic identification and monitoring process for legal and compliance risks can help companies navigate the pitfalls, uphold a positive image and build consumer trust. 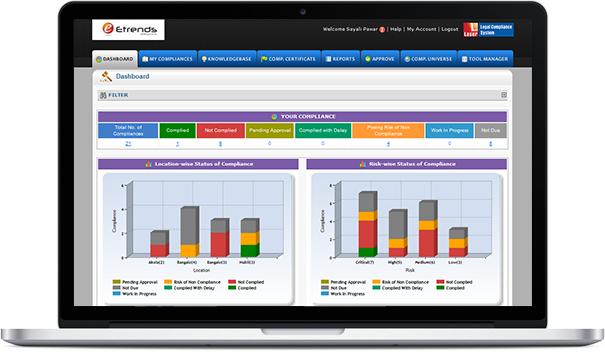 Implement a transparent and uniform process for managing legal compliances in your organization with the Laser Legal Compliance System (LLCS®) – a centralized, access-controlled environment for monitoring the status of legal compliances that brings compliance teams, compliance owners and the management on the same platform. Bring compliance teams, compliance owners and the management on the same platform. Get real-time updates and enterprise-level compliance statuses in a single window. Get enterprise level, location level, risk category level, department level and law level status of compliance. View compliances along with its proof and list of non-compliances if any. Initiate transparency and confidence in certifying compliances at all levels. Decentralize compliance management at location level and empower local administrators to manage compliance at location level. Dashboard allows you to easily monitor status of critical and high risks category compliances. Get complete compliance related information such as due date, owner and status with compliance reports. Best practice workflow to address changes in compliance. Single window interface allows compliance owners to view list of compliances required to comply in a week, a month or a quarter. Organize compliance information at one central place to offer easy access to information when it's needed the most. Browse it law-wise, act-wise or simply do a keyword search. To download the features of LLCS® etc features, please click here. Etrends is a leading provider of GRC Solutions to top notch business houses in India and abroad. We have a range of applications under the brand name Laser® that cater to the requirements of an organization specifically for risk.